A thick, luxuriant hand treatment that gently polishes and super-conditions the skin. Features a blend of mineral salts, refined sugar cane, jojoba soft-beads and sweet almond oil. Hands don't have to reveal your true age - with regular care and maintenance, you can improve their appearance. CND® SPAMANICURE® products are specially formulated for the unique needs of hands, so they're ideal for creating younger-looking skin. Almond SPAMANICURE® have a warm, comforting feel and fragrance that soothes overworked hands. Ultra-thick, ultra-lush Almond Moisture Scrub uses natural elements to polish and smooth skin. Finely-milled mineral salts, refined sugar cane, jojoba soft-beads, and sweet almond oil clear away skin woes from first application. 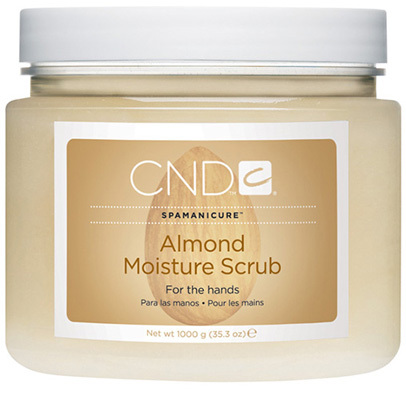 Clients will return regularly for another satisfying scrub with CND® Almond SPAMANICURE® products. Use after Almond Milk Bath, and before Almond Illuminating Masque. Finish with Almond Hydrating Lotion.